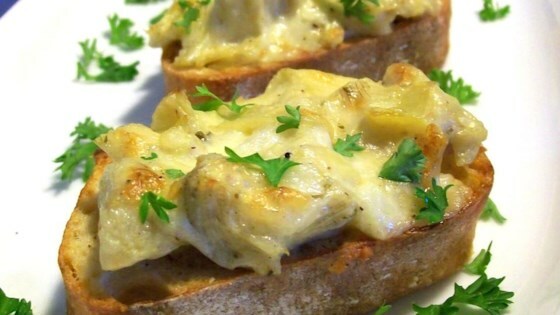 "This is a great bruschetta recipe based on an artichoke dip. It's always a huge hit! Try adding spinach or tomatoes!" In a medium bowl, mix marinated artichoke hearts, Romano cheese, red onion and mayonnaise. Top French baguette slices with equal amounts of the artichoke heart mixture. Arrange slices in a single layer on a large baking sheet. Broil in the preheated oven 2 minutes, or until toppings are bubbly and lightly browned. I'll have to say this was a flavorless dish. Even after I tried to spice it up with some garlic it still tasted pretty bad. I ended up throwing most of it away. This was very good. Next time I make it I think I will add a little fresh garlic. Definately toast the bread before topping with the artichoke mixture. I tried it both ways. Very easy and can be made ahead of time. I used parmesan and also added a roma tomato. Next time I may add slivers of frsh basil. I made this for my annual block party. Everyone loved it! I toasted the bread first then put the topping on.